This entry was posted on August 18, 2009 at 9:52 am	and is filed under Maysa, Pictures, post DOC band. Tagged: brachycephaly, Maysa, Pictures, plagiocephaly. You can follow any responses to this entry through the RSS 2.0 feed. You can leave a response, or trackback from your own site. Wow, you are right! I do see an improvement from 3 months ago. That’s amazing and I’m so glad it’s even better. Who would have thought? She looks very round and symmetrical, congratulations. My child is 21 wks old and I have not decided what to do about his head yet. He looks quite square, especially from the front and has these bumps right above his ears that really stick out. I want to pay for a DOC band, but the nearest Cranial Tech is about 5 hrs away (one way). It’s expensive and the trip is long and my major hurdle is my husband, ugh. If it were not for him, I’d already be in Chicago! Lol. If you would, I would love for you to perhaps email me so I can tell you my story and show you some pictures of my child. I really want someone’s opinion that has been there. I have been reading posts on the Yahoo group and Baby Center but I just really want to talk to someone personally who has been there and done that. Thank you, I really appreciate it. This is the first time I have seen your website and I appreciate you writing about this and documenting it. It helps me decide what is best for my daughter. I just wondered if you would give me your insight. I have a 3.5 month old daughter and her head shape is almost identical to your little girls at 6.5 months. We had an appointment today and we can move forward with a helmet. Yourself having gone through this, would you recommend we move forward? I was looking at all your pictures, and your little girl is absolutely beautiful by the way! Just finished sending you an email. I look forward to hearing back from you. If I could go back in time and if Maysa was 3.5 months old again, I would get started with the band today. While I believe that repositioning works for certain people, it didn’t work for us. Maysa was a back sleeper from day one and slept for long hours while she was an infant. She also had acid reflux and couldn’t stay on her tummy at all. The tort didn’t help either. A band at 3.5 months would have taken care of her misshapen head right away. 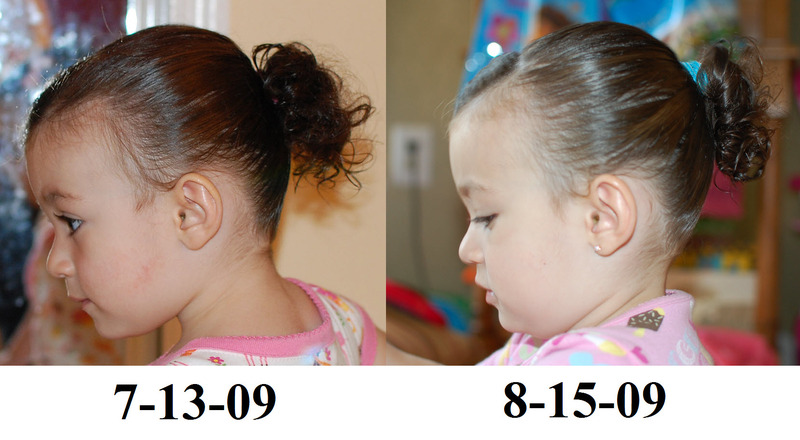 Instead, it took us 11 months to get to where we are, which is still not perfect, by comparison to her sister’s head. In your note you do not mention if your daughter has plagio, brachy or a combination of both. Either way, you want to know what her starting numbers are (what is her asymmetry and what is her cephalic index, and also if she has any ear asymmetry). I would also start taking pictures at least every two weeks (top, profile and front pictures). Just like you’ve seen in Maysa’s site, it helps see how well and how fast she is progressing. Another piece of advice in case you cannot get her in a DOC band, do your research and make sure that the band/helmet and the orthotist that will be dealing with your daughter are reputable. Maysa spent 3.5 months in a passive helmet from ECA and it was all for naught. Now that I know better, I would never have put her in that plastic shell ever nor would I have trusted her orthotist, Joe Terpenning. Another thing to be aware of is torticollis. If she has tort, get her into Physical Therapy and do the exercises with her at home to help resolve that ASAP.